You asked for it... and asked for it again... and then you asked for it some more. And it's finally happened -- DRAsvitt has made a set of tiny ships and put them for sale on eBay! You can bid on them here -- but be warned, you'll have some competition! (Note to everybody else: we don't normally promote auctions -- so don't ask us to mention the copy of Wing Commander III your dog threw up on that you want to make a mint off of in the news...). Pictured below are the ships that are for sale (TCS Victory, TCS Midway, shuttle, Thunderbolt, Hellcat and Arrow) and one that isn't (Confed Space Station). A little change in color to a skin even makes an old vampire look new again. 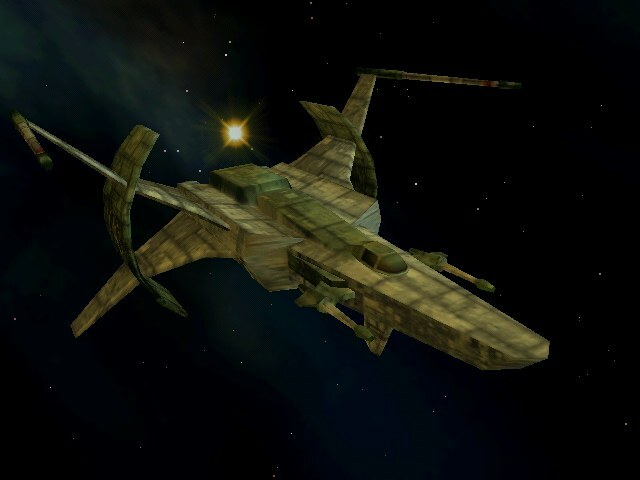 Since we last met the Babylon 5 Commander has posted the Tloth, the Xill and the EA Freighter (pictured). Wa-hoo. Better Than Nothing! But Not By Much! Delance has found an article about abandonware at GameSpot that talks about (and for some reason includes a picture of the French edition of) Wing Commander. Here's the article... and here's the part about WC. At the risk of editorializing, the person who wrote the 'response' about Privateer is stupid and should die. Here's Raptor to introduce Walking Wounded (heyyyy), the latest posted chapter of Holding the Line. You can read it here. HTL continues with a story called "Walking Wounded", written by Shaun "Iceman" Rashid. This story is set aboard the light carrier TCS Endeavour, one of the ships assigned to the Combined Fleet in Loki. As you saw in past chapters, the Border Worlders were drawing the attention of the Nephilim fleet while the rest of the human fleet moved into position for the kill. This series follows the Endeavour's crew as they try to eliminate their target. Please send any and all comments to Shaun at velacia@rogers.com, not to me. No, it's not Casey's birthday... nor are we celebrating the development of torpedos or black ops heavy fighters. The Lancers Reactor marks its second anniversary today! TLR is the world's premiere site for StarLancer & FreeLancer news and information... great job, guys! I'm short for updates... so, you figure this out instead. 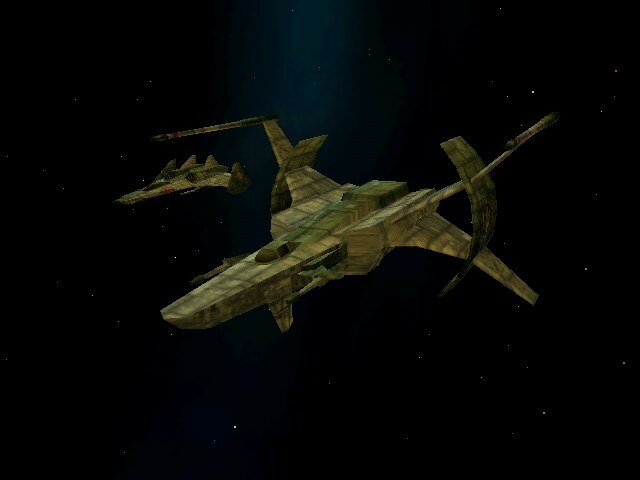 Grab Vision Engine versions of these two Babylon 5 ships at the Babylon 5 Commander web site, courtsey of KillerWave. Files section. Please be patient as we work to restore the CIC's Files Section. A recent BlackLance.org server move made them unavailable... but we're working to get them back online as fast as we can! Chris reports that brick and mortar Suncoasts are selling the VHS Wing Commander movie for as low as a few dollars a piece! Go stock up on WC movies! They make great... hmm. Here's one that's sure to please ace "Hyphen" One -- the Unknown Enemy web site has been updated with a sample of their new theme music. How great is it? I have no idea, since I'm at work with no speakers! They've also set up a poll asking "How much longer are you willing to wait for UE?" Citizens of the World, Help! Are you a Wing Commander fan from a country other than the US, German or Japan? Then I could use your help! My Guide to Wing Commander Collectables is just about as complete as can be for those three countries... but I need more specific information on which games were released where (and in what format, in what language and so forth) around the rest of the world! Help me finish this project once and for all... by e-mailing loaf@wcnews.com! No, not the system Senator More was from. 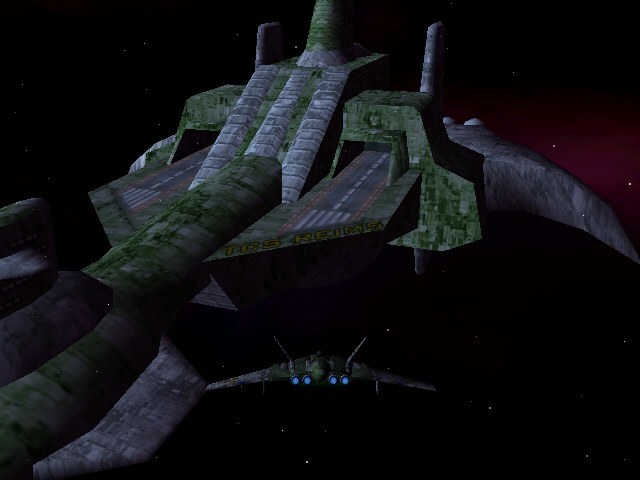 Today's Vision Engine Babylon 5 Commander Ship of the Day is the Primus class Battlecruiser. Get it from their files section. Anybody out there want to take pictures of these things for us? Vegastrike 0.2.0 is complete! I have worked for months to make this release possible! Windows users download it and run Setup then Mission Launcher.exe ! Note: Setup will save and exit if you hit view readme or close it with the X.
Linux users grab source, compile and run from data directory. It features system exploration... over 100 star systems have been painstakingly modeled for the entire Sol and Vega sectors! Position yourself inside a blue clear ball and press the j key to instantly transport your self to neighboring star! Also included are dense, deadly asteroid fields and exotic nebulae to explore and scout. Switch ships with [ and respawn (with semicolon) have been integrated to this release in the last minute. Additionally an installer and a mission selector by Reliant have been ported to Windows for use with windows people. Many missions have been carefully created for your pleasure. Please send comments to vegastrike-users@lists.sourceforge.net! We appreciate user feedback and respond carefully! 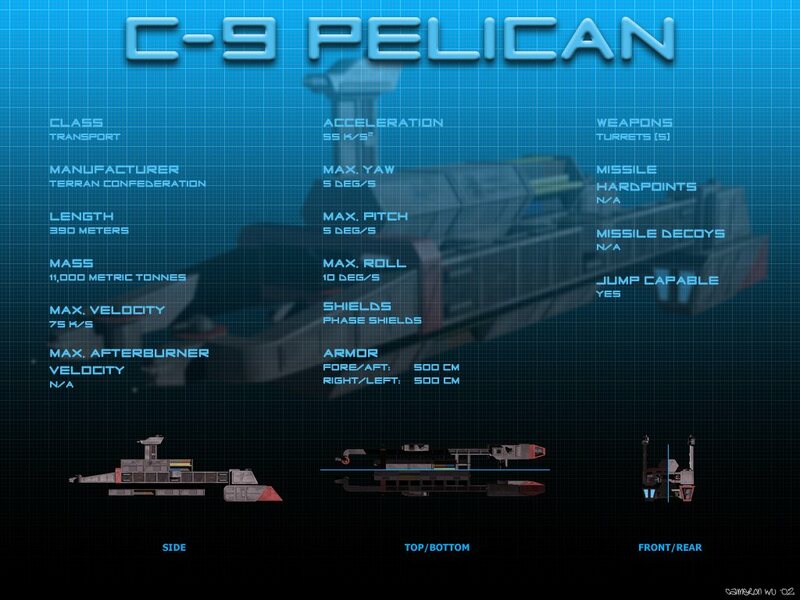 Another cool 'info sheet' from CamW, promoting his upcoming 3D-movie Raiders... this time, it's the C-9 Pelican class transport. 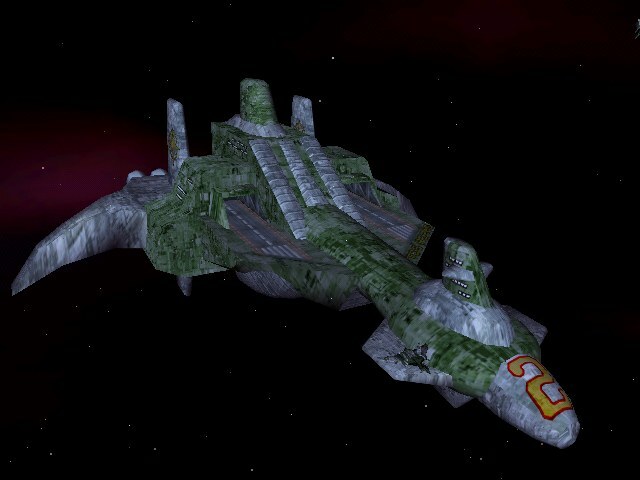 Today's Vision Engine Babylon 5 Commander Ship of the Day is the GQuan class Heavy Cruiser. Get it from their files section. 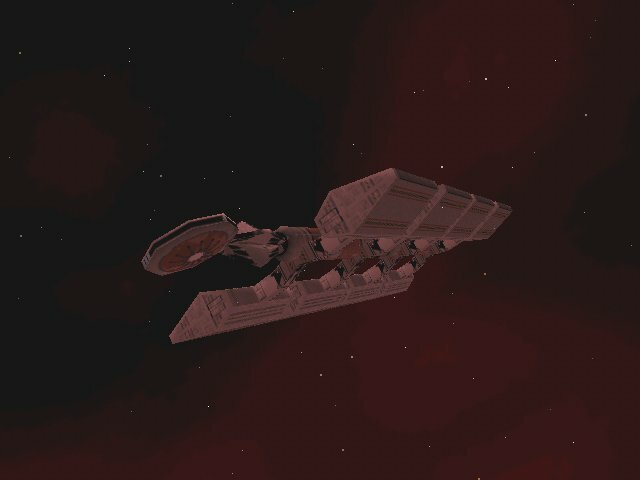 Wing Commander: The Wasteland Incident (WCWI) is, a new and exciting MOD utilizing the Wing Commander Prophecy Secret Ops Engine. This new MOD will include 20 missions, a mission branch, 7 cut scenes and 3 endings, in 3 episodes. It will also feature new and modified ships, and what I hope will be a truly exciting plot. We are currently looking for 3D modelers, Character Animators, CG Set Designers and Mission Programmers. 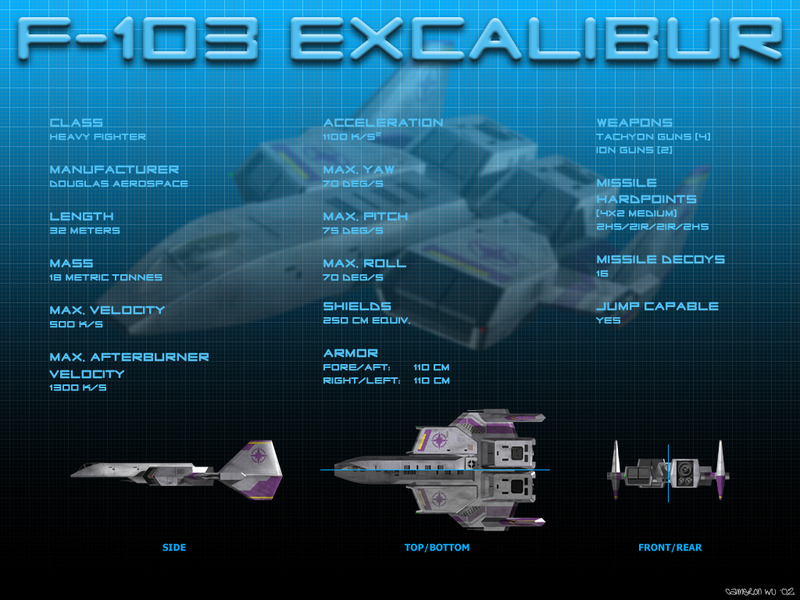 For additional information head to http://wasteland.solsector.net and check out the sneak peek of the into. 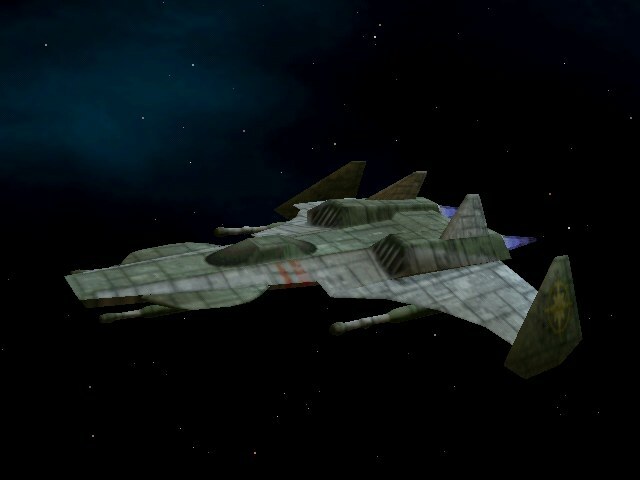 Today, KillerWave has posted the Sharlin class Cruiser to his Babylon 5 Commander page. Grab it in their files section! And then here's Raptor to introduce our weekly chapter of Holding the Line. You can find Chapter 122 here. HTL continues with part seven of the Tiger Hunt series, called "Throwing The Dice", which follows the Border Worlds carriers as they continue drawing the attention of the Nephilim fleet. This chapter is set shortly after a "A Den of Death", but focuses on the Battlegroup Valkyrie's other carrier, the BWS Valeria. This story is written by yours truly, so please send any and all comments to me. As I've said before with regards to Border Worlds technology, seeing as we didn't get to see anything of the Border Worlds military in WC:P or SO, we have no way of knowing for sure how good their tech is. The working theory I'm using is that they're at the same place relative to Confed that they were in WC4. Back then, they were mostly using WC2 tech like Rapiers and Sabres spearheaded by small number of craft that were equivalent to Confed's WC4 craft, like Banshees and Avengers. Now, they're using mainly WC3/WC4 grade craft, spearheaded by a small number of craft that are similar to Confed's WC:P craft, such as Retaliators and Stalkers. 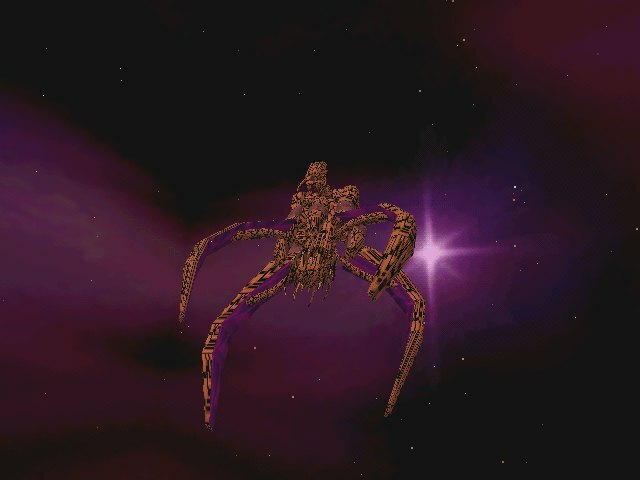 KillerWave is making available a Babylon 5 ship for Prophecy's Vision Engine each day for the next month or so at his Babylon 5 Commander project website. Today's ship is the Omega class Destroyer... You can find it in their files section. I'm desperately seeking someone who can read Japanese text -- the Super Famicom edition of Wing Commander 1 has some interesting segments that aren't included in the American version... and I think we'd all like to know what happened in 2615 on the enhanced timeline! If there's anyone out there willing and able to help, please contact me. Thanks! The Black Lance Headquarters has undergone a major revision... with a new look for the 21st century! Anyone with an interest in Wing Commander style role playing games owes it to themselves to check out the nifty new site. 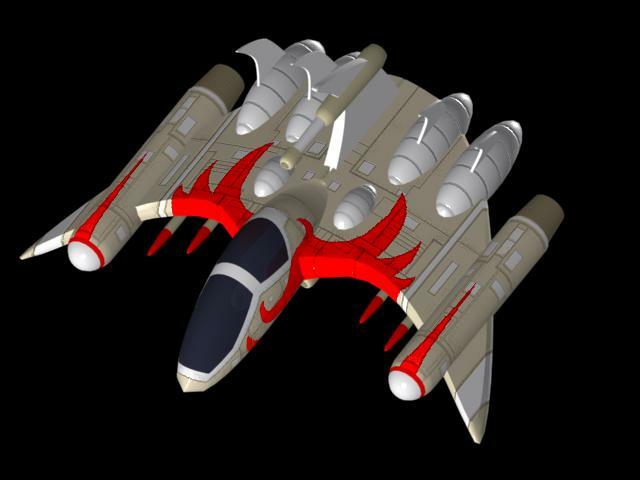 Anime-style Spirit says go visit this URL for more zany Japanese versions of the Wing Commander 1 Claw Marks character pictures. There's lots of interesting stuff in the Japanese Claw Marks... and we'll get it all online ASAP! Outsider asked me to post this note regarding an Online SIM called Ace of Angels. 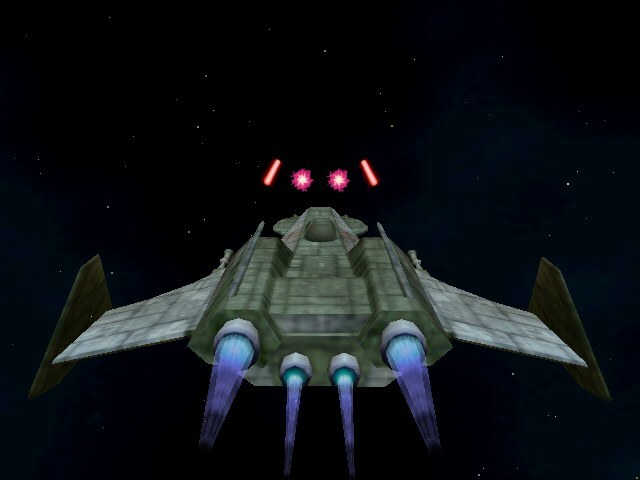 He thinks it may be interesting for Wing Commander fans... check it out! When it rains, it pours: DRAsvitt is back to show off three new Wing Commander ships... and five ships from the hip online game SubSpace. Quoth "I haven't made very many WC ships lately because I ran out of the Micro Machine display stands that I used to make them with. The most recent WC ships have been made with Plexiglas and Super Sculpey clay. The Subspace ships are made out of pieces of Military Micro Machines and some sculpy clay." WC ships are (interior left to right): Snakeir, Fralthi & Gilgamesh. 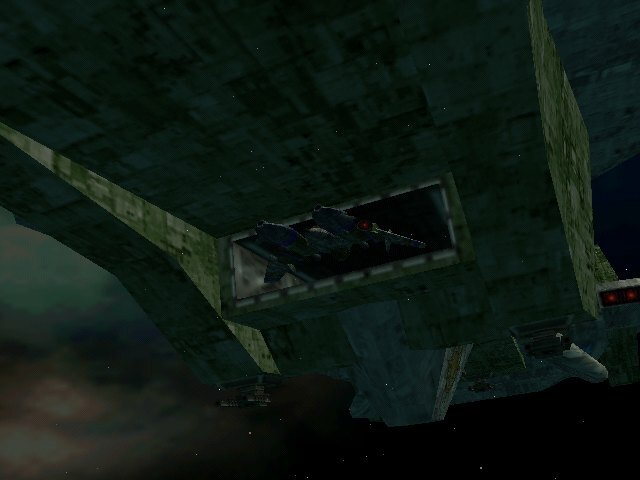 SubSpace ships are (exterior left to right): Spider, Weasel, Leviathan, Javelin & Terrier. Remember Space Quest? Well, it's back... in pog form! GameSpot reports that Sierra may be bringing back its wonderful Space Quest franchise... after an eight year hiatus (article)! 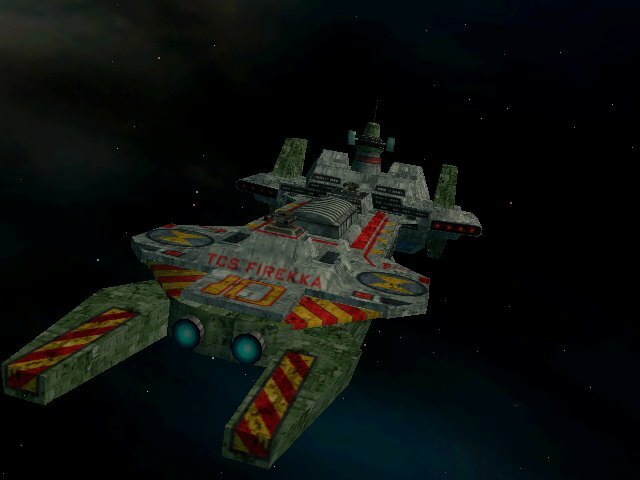 The old Sierra 'Quest games harken back to a better time, when people weren't such idiots... and bringing back such a popular series after so long a time away should, at the very least, warm the hearts of any Wing Commander fan. The Wing Commander: Standoff mod for Secret Ops has posted eight new screenshots, showing Rapier IIs, Raptors, Sabres and a Waterloo. And aren't those WC1/2 style gun spheres neat? So, You Want to Buy a Rapier? I'm telling you, you do! And you can... for about 8,000 pounds. 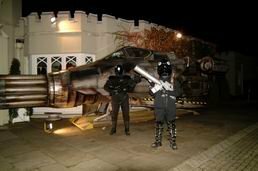 Weird & Wonderful will be auctioning off one of their 30 foot long real-life F-117b's at Fleetwood Owen in April. If you've got lots of money, this may be your only chance to buy a real Wing Commander starfighter. After that look at the reserves who are preparing for the final battle, we're now going to switch back to the front line, the delaying action being fought in the Loki system. As you might recall, the Border Worlds carriers were acting as the bait in an elaborate trap for the Nephilim, while the rest of the fleet closed in for the kill. While there have been several preliminary skirmishes, the battles to come are going to be bloodier by far. 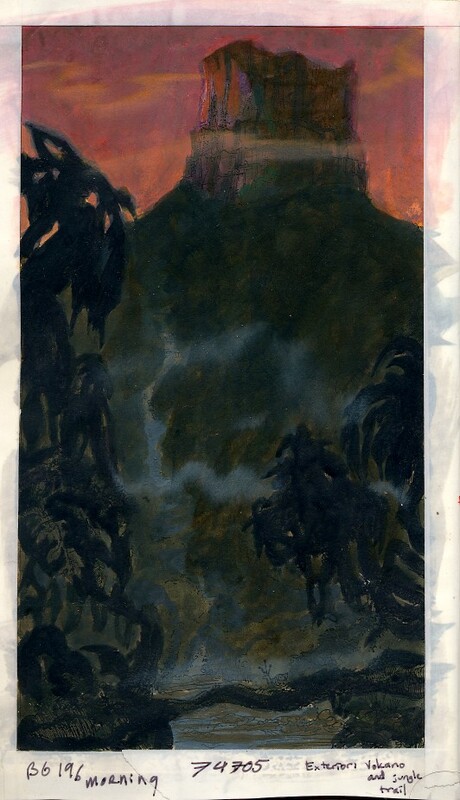 We kick off with part six of the Tiger Hunt series, "A Den of Death." This chapter focuses on the Harbingers, a Bearcat unit serving with Union's Battlegroup Valkyrie. The Harbingers had previously carried out a lethal ambush on Nephilim scouts hunting the Border Worlders, but the squadron's own losses had instigated a revolt within its ranks. This chapter picks up from there. This story is written by Yu Fei "Phalanx" Leung, so please send any and all comments to him at ph4l4nx@hotmail.com. Here's an interesting press release -- Wing Commander III for Sega Saturn... a game that was never released. Since only weirdos bought Saturns, Origin's post-Crusader lineup was scrapped... and Wing Commander III (and IV) were shelved. Coulda been interesting... I wonder how much work was done! Read the full thing here. The Sega Saturn provides an exciting platform for bringing Origin Systems’ groundbreaking _Wing Commander III_ to the advanced entertainment system market. The Sega Saturn’s built-in texture mapping and impressive 640 x 480 high-resolution graphics provide exceptional video quality and realistic gameplay. In true interactive style, the player controls the intriguing twists and turns of the plot by engaging face-to-face with such legendary actors as Mark Hamill (_Star Wars_ trilogy), Malcolm McDowell (_A Clockwork Orange, Star Trek_) and John Rhys-Davies (_Raiders of the Lost Ark_). ... and have ourselves a snack. Here's something we should have done a long time ago: a press release archive. Unfortunately, as we did not do it a long time ago, it's severly lacking in press releases. If you've got any lying around, we'd love to archive them... for future generations and all that. Send any information you have to me. 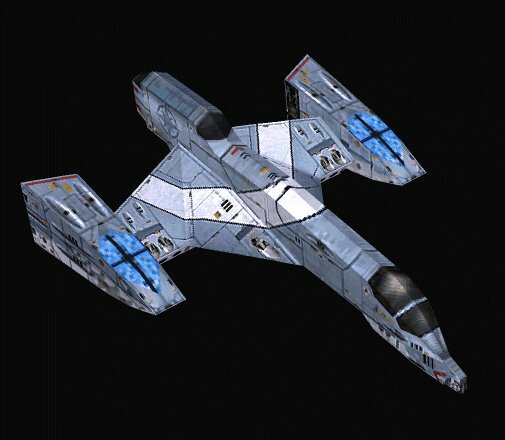 A while back I offered a chance for some trivia... find all the 'Saab' references in Wing Commander. While nobody actually entered, lots of people wanted to know the results... go figure. Here's what I found (I'm giving the GOLD STAR to myself, unless somebody else can find more...). 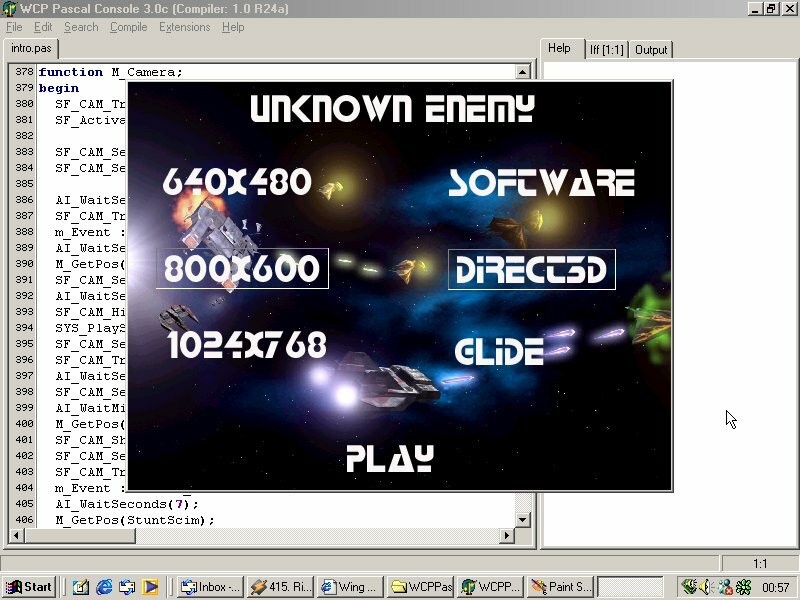 Here's an interesting article -- a collection of messages posted by Origin to Compuserv back in 1991... giving 'preview' specifications for the ships of Wing Commander 2! 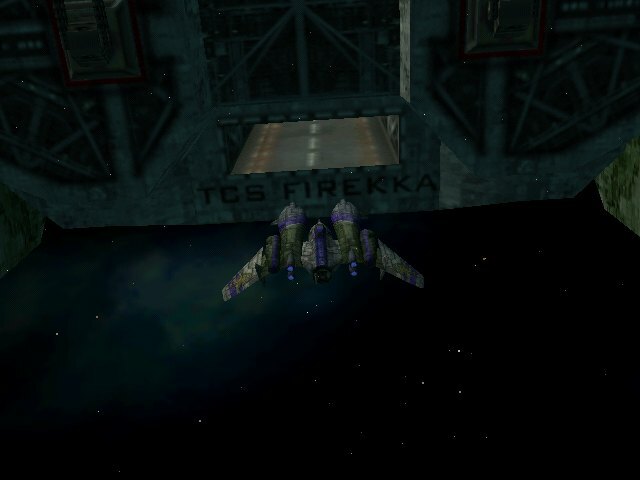 A few fun notes: this is the first external mention of the name 'Bloodfang' for Thrakhath's fighter... and the Concordia is called a 'Super Cruiser'. Hmmmmm... Read the collection here. So I was just having lunch with Joe Garrity, and he asked me what became of the guy who'd been sending in pictures of neat little WC ships he'd made. "Hey, yeah! ", I replied -- having no idea where myself. Now, a week later, though, DRAsvitt is back! With more ships! And here they are! (Left to right: Waterloo, Dralthi, Morningstar and Crossbow. 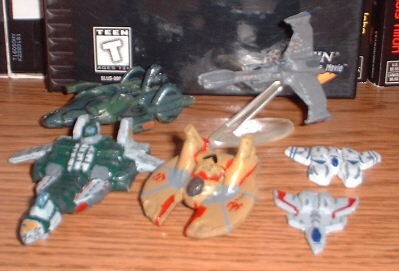 Two B5 ships, the Liandra and the Excalibur are in the second row). 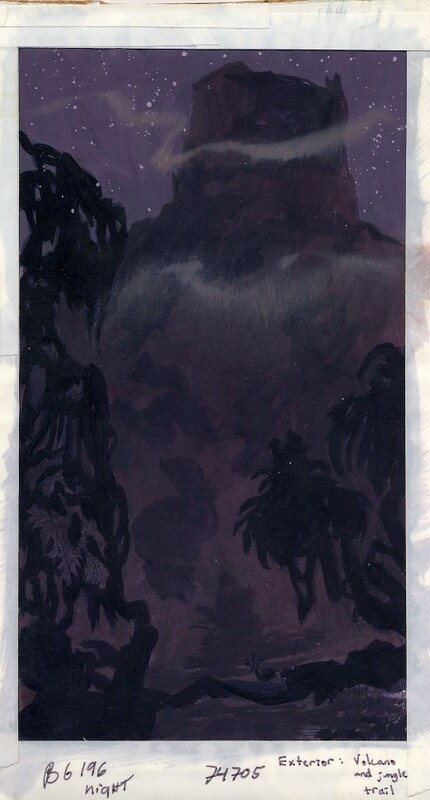 You can see more of his work in the May and August 2001 archives. Filler found THIS Shockwave file while trolling Google. To quote Colonel Blair, I don't have a clue. 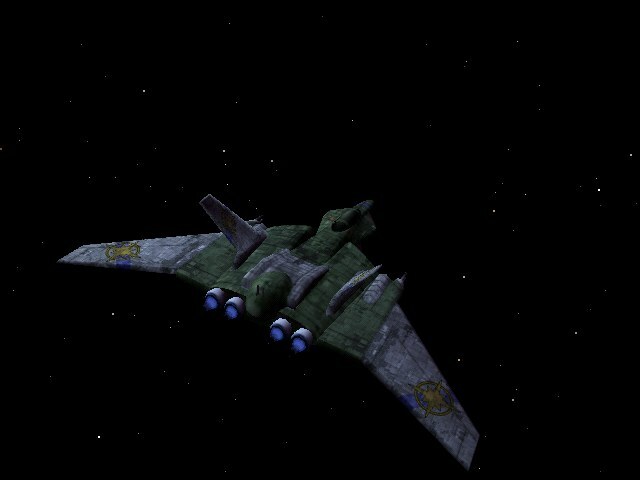 We are an online RPG based on the Kilrathi Culture and of course the Wing Commander Saga :-) Our RPG takes place in the year 2669 after the destruction of Kilrah. 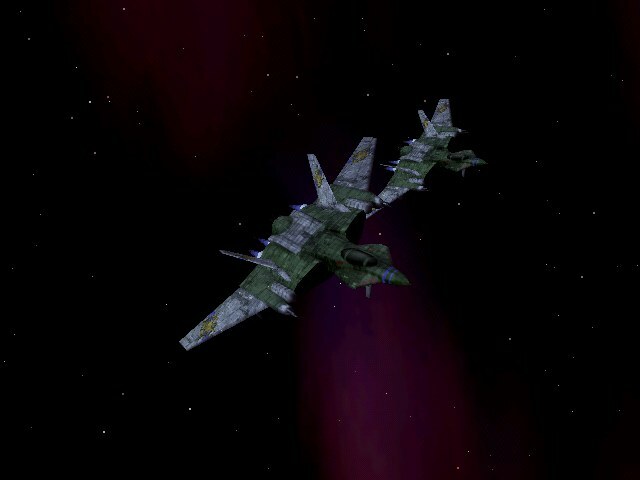 But there are some differences to the then following Wing Commander Games. In our RPG the signing of the treaty between Kilrathi and Terrans never happend. Both the Kilrathi and the Terrans do have an unsure future. The war still goes on and nobody is able to tell who will win or when the fighting is going to end. 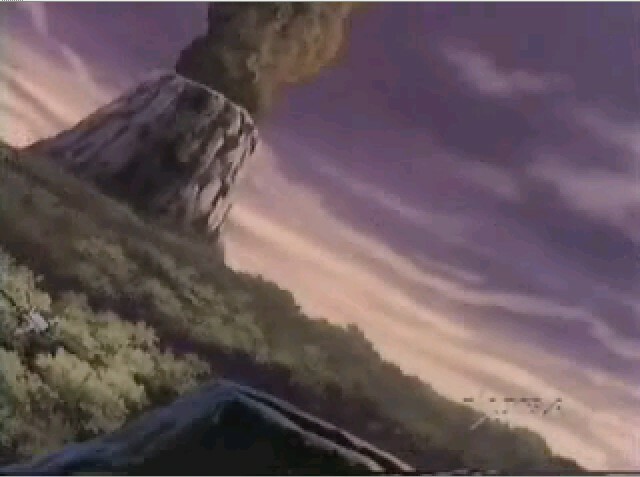 That was it so far about the story background. Anton "Tolwyn" Romanyuk has sent in a status update for the WC Saga mod for Conquest: Frontier Wars. 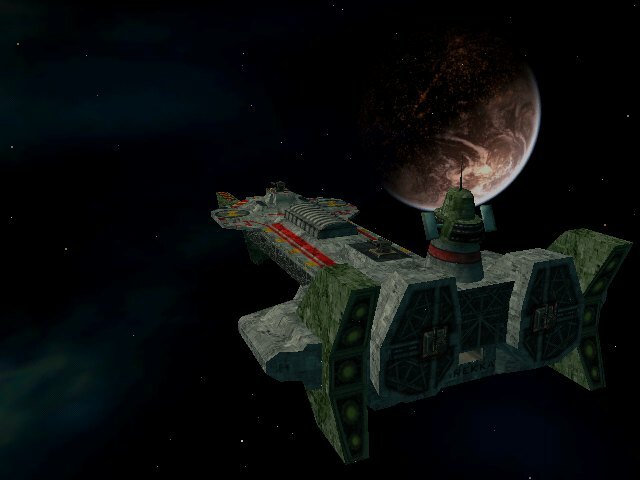 Almost every Confederation ship from Wing Commander 3 and 4 has been finished... and the WCSaga homepage has a nifty new look! Check it out. It's beginning to feel a lot like... time for a new version of mIRC. Head over and grab a copy of version 6.0 -- it supports multiple servers and big fat line things now! Then come visit us on #WingNut. Chris reports that fans of Ultima Online can get a free Ultima Online: Lord Blackthorn's Revenge comic book if you stop by a Babbages/GameStop/Software Etc./etc. in the next few days. Or you can get it by pre-ordering the game... and you get a free action figure! And social acceptance! This war agrees with them: AVault reports that Electronic Arts has more money than a dead fish. This, of course begs the question: just how much money does a dead fish have? Video game publisher Electronic Arts reported a 50 percent jump in its fiscal third-quarter profit on Wednesday, led by strong sales for its Harry Potter games franchise. Redwood City, California-based Electronic Arts reported a net profit of $132.3 million, compared with net earnings of $88 million in the year-earlier period, Reuters reports. The company reported earnings of $147.1 million; revenue in the quarter was $832.9 million, up from $640.3 million a year earlier. The company’s online division, EA.com, posted a loss including charges in the quarter of $36.2 million, though revenue nearly doubled to $21.9 million from $11.2 million in the year-earlier period. During the quarter, the company phased out its heavily promoted online adventure game Majestic, which was well received by critics but ended up a commercial failure due in part to its cumbersome registration process. Next up is Raptor's introduction for the latest chapter of Holding the Line. You can find the chapter here. WCA Art 13: ... and Night! Hurrah, Wing Commander Academy artwork is back -- for two (and possibly three) more days! 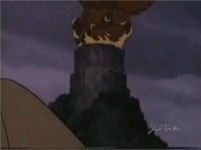 This is a shot of the volcano from Episode 4 - Word of Honor... in the daylight! There was a great response to my request for German WC guide help -- and I've put all the new information at the German Guide Page. Thanks to Christian, Obee, Stefan and chris_mungo@gmx.de for providing all the information now available!